Yet another Christian Arab ends up the water carrier dhimmi for Islam. This time with DC Comics. Geoff Johns, creative director of DC Comics made the latest Green Lantern an Arab. And he debuts it at the anti-Israel, jihadist, tax-funded Arab American National Museum, which, as I’ve repeatedly noted, is run by Muslims, who hijack Christian Arabs’ achievements in America in order to cover up their own extremism and lack of achievement. Now Johns is bending over for them, too. Moron. 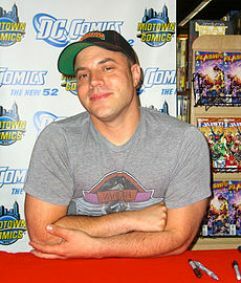 DC Comics bigwig Geoff Johns, a Lebanese-American who grew up metro Detroit [sic], is coming home for events marking the debut of the first Arab-American Green Lantern. Johns, a noted comic book writer who’s also DC’s chief creative officer, will sign copies of “Green Lantern #0” at Green Brain Comics on Sept. 7 and be the star attraction at two events at the Arab American National Museum on Sept. 8. 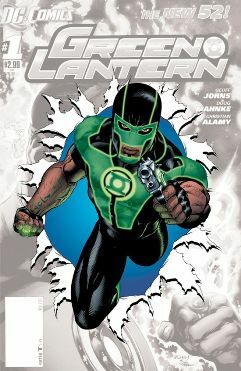 “Green Lantern #0” will introduce Baz, the landmark character who’s the first Arab-American to be the superhero Green Lantern. In terms of superhero comic books, this represents the first major character who is Arab American, according to Green Brain owner Dan Merritt. . . . The two events at the Arab American National Museum on Sept. 8 include an invite-only, superhero-development workshop for local youths. Um, newsflash (to Julie Hinds, the pandering, lying “reporter” who wrote this gushing propaganda article): the Arabs who run and hang out at the Arab-American National Museum already have superheroes: Osama Bin Laden, Yasser Arafat, Hassan Nasrallah, Ayatollah Ruhollah Khomeini, Mahmoud Ahmadinejad, and so on. In fact, Ron Amen, who was until recently the longtime operations manager of the museum, is a proud Shi’ite Muslim, whose family members–cast members on the now-defunct “All-American Muslim”–bragged that they began wearing the hijab (the Muslim female headscarf) to honor Khomeini’s Iranian revolution, during which extremists took over Iran, the U.S. Embassy was trashed, and Americans were held hostage for 444 days. By the way, look at the pic of the Baz, the Arab Green Lantern above. He has an Arabic tattoo, which says “Al-Shaja’ah” or “bravery.” And, yet, the real bravery would be a comic book superhero who denounces and fights jihad, but Geoff Johns is merely helping enable it by appearing at that museum. On the other hand, his Arab Green Lantern also has the appropriate headgear you see at HAMAS and Hezbollah marches in the Middle East. For them, green is not the color of the Green lantern, it’s the color of Islam and HAMAS. But don’t count on Geoff Johns to be accurate about the Muslims whose asses he is now kissing. It’s clear Baz will serve, just as the Arab American National Museum does, as a proxy for Muslims as “brave, patriotic Americans.” I saw all the bravery I needed at Fort Hood. And Ground Zero. And Times Square. And on the Undiebomber’s flight. And in the Marine barracks and U.S. Embassy in Beirut. At the Khobar Towers. And on the U.S.S. Cole. And so on . . . and so on . . . and so on. Apparently, this comic book creating idiot, Geoff Johns doesn’t realize the reason he’s in America: because his Christian Phoenician family members fled from the real Arabs in Lebanon: the Muslims. (That’s why the vast majority of Christian Lebanese are here.) Now they are turning over in their graves. My father was a Christian from Syria who came to the United States in 1912 because of repression in his native country. He was one of the first to give money to Israel in 1948. His sympathies were pro-Zionist, not pro-Arab. Masry echoed the views of his father in a Jewish newspaper. While I didn’t agree with his moves as a trial lawyer, he got it right on this one. So sad that the ignorant Geoff Johns does not. AN Arab Green Lantern replete with jihad tattoo created by a Christian Arab. Way to go, Geoff… idiot. He probably thinks they won’t behead him when the time comes. Geoff Johns is half Lebanese, for what it’s worth… I wonder what the other half is? So the Green Lantern is gay and and Arab. That’s a nice combo! DS this is yet another example of how the Christian Lebanese do indeed like the Mooooooooslim boot on their neck. Disgraceful! It’s annoying that Moooslims coattail ride on all who leave them in the dust. But the people letting them coattail ride are pandering to sicko idiots who contribute nothing but malice and bad intent to the world. I’m not sure what it is about this made-up character that has the left’s juices flowing. Back when I was a little kid, I was a HUGE fan of the Super Friends. I had all the toys, including Green Lantern. I even had a pewter green lantern ring with an iridescent center. I thought it was the coolest. DC has gone completely bonkers in the last few years. The print media is dying, and comic books are certainly no exception. I’m no longer a fanboy, but I have seen a few news stories about how DC and parent company Time Warner are “reinventing” their stable of characters to make them more “relevant” and “diverse” (read: less white/straight/American). It’s desperate and pathetic. First they make the *1940s* Green Lantern a flamboyant homosexual, and now this. To me, the comic book cover posted above looks like it would be more at home in a storyline about a terrorist somehow stealing the ring and using it to create a vast crime syndicate or something. Today, the lunatics have truly taken over the asylum. They’re poisoning the young people of America – one mind at a time. And getting paid by the parents to do it!! Green Lantern, like so many other super heroes, was created by a couple of Jewish fellows, in this case, Bill Finger and Martin Nodell. As comic books become less and less relevant and less readable, rather than create something new, those who have always stolen from Jews continue to do so. What’s next, Batman & Superman join the muslim brotherhood? Marvel has better comics anyway. GL’s costume looks like a ripoff of the Iron Man suit. Marvel comics are more relevant today and are trouncing the morons at DC because of the great STAN LEE a JEW! Even the oozing Islamaphites oozing their icky goo into another icon of great free America-the comic books are not missed by Debbie.Ever. Thank you so much Debbie for all you do! They’ll change it back when the sales tank. this is so incredibly unbelievable!! !…….it’s absolutely disgusting!!! The Green Lantern’s oath in this form is thought to be the creation of Alfred Bester, who wrote many Green Lantern stories in the 1940’s. Alfred’s mother, Belle, was born in Russia and spoke Yiddish as her first language before coming to America as a youth; his father was Jewish. What a perversion of an American icon! DC has bent the envelope on left-wing politics since the 1930s. They idolized Kennedy in the 1960s, and took digs at Eisenhower in the 1950s. They ‘modernized’ their major superheros in the 50s and 60s, and made sure that blacks played especially prominent roles. For instance, Jimmy Olsen would fight slumlords, the women in the comics strongly supported women’s liberation, etc. Then homosexuals played a disproportionally prominent role. During the 40s, 50s and 60s, they would write political messages cloaked in the garb of a social workers’ organization. The superheros virtually never fought against Communism during the Cold War. He will probably make a green scimitar with his power ring. How about a nice Jewish hero, that loves his mother. Happened upon this article while doing some searching on Google… can now officially say I found the online home of internet bigotry. Nothing like a blog run by someone who has zero firsthand knowledge spouting “news” for a loyal following of intolerant morons. Yeah, honestly! Looking at these comments makes me want to puke! A bunch of bigots who are the most right wing conservative idiots ever! I mean, come on, read a book, find out more before blindly attacking homosexuals and Muslims! Debbie Schlussel needs a wake up call to reality!